Blessed be the LORD, the God of Israel, From everlasting even to everlasting. And let all the people say, "Amen." Praise the LORD! Blessed are you, LORD God of Israel, from eternity to eternity; Let all the people say, "Amen!" Hallelujah! Blessed be LORD, the God of Israel, from everlasting even to everlasting. And let all the people say, Amen. Praise ye LORD. Blessed be Jehovah, the God of Israel, From everlasting even to everlasting. And let all the people say, Amen. Praise ye Jehovah. Praise be to the Lord God of Israel for ever and for ever; and let all the people say, So be it. Give praise to the Lord. Blessed be Jehovah the God of Israel, from eternity and to eternity! And let all the people say, Amen! Hallelujah! 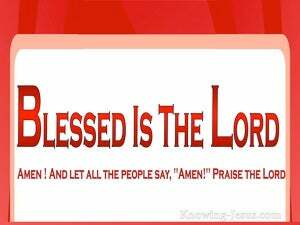 Blessed be the LORD God of Israel from everlasting to everlasting; and let all the people say, Amen. Halelu-JAH. Blessed be Jehovah the God of Israel from forever and even to forever: and all the people saying, Amen. Praise ye Jah. 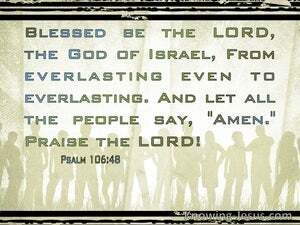 Blessed be the LORD God of Israel from everlasting to everlasting: and let all the people say, Amen. Praise you the LORD. Blessed [is] Yahweh, the God of Israel, from everlasting and to everlasting. And let all the people say, "Amen!" Praise Yah. Blessed is Jehovah, the God of Israel from everlasting to everlasting; and let all the people say, Amen. Praise Jehovah! Blessed be the LORD God of Israel from everlasting, and world without end. And let all people say, "Amen, Amen." Praise the everlasting! Hallelujah! The Lord God of Israel deserves praise, in the future and forevermore. Let all the people say, "We agree! Praise the Lord!" Blessed be the LORD, the God of Israel, from everlasting to everlasting. And let all the people say, "Amen." Praise the LORD. Blessed be Yahweh, God of Israel, from one age even unto another, And all the people, shall say, Amen! Praise ye Yah! Blessed is Jehovah, God of Israel, From the age -- and unto the age. Amen and Amen. Blessed is Jehovah to the age. Amen, and amen! And David blesseth Jehovah before the eyes of all the assembly, and David saith, 'Blessed art Thou, Jehovah, God of Israel our father, from age even unto age. That they may observe His statutes, And His laws may keep. Praise ye Jehovah! since, if thou mayest bless with the spirit, he who is filling the place of the unlearned, how shall he say the Amen at thy giving of thanks, since what thou dost say he hath not known?